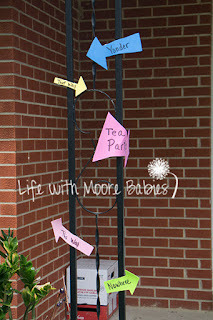 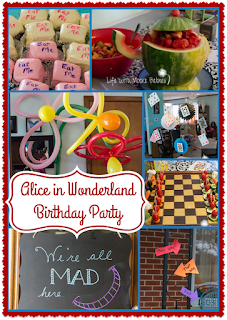 Still catching up on sharing parties, so this past year was my daughter's 8th birthday, and she chose an Alice in Wonderland themed birthday party! 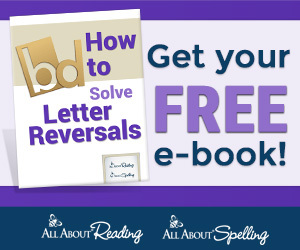 I'll start by saying we decided to pull from the cartoon version of the movie as well as the both Alice's Adventures in Wonderland and Through the Looking Glass which we had recently read, so if you are just using one or the other you might have to adapt a few things! 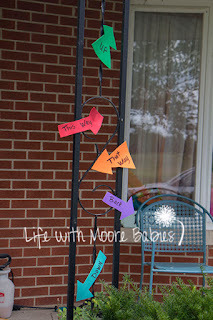 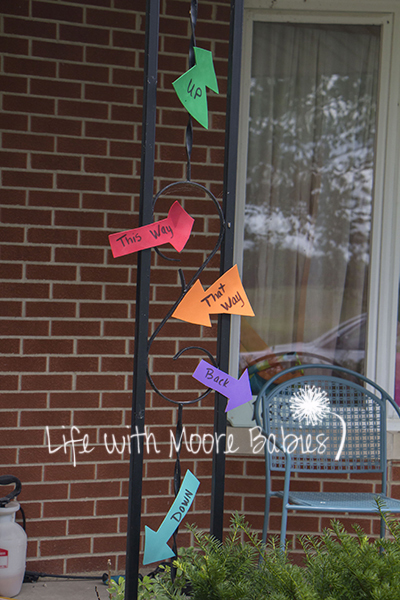 We started our decorating before we even got to the front door with craft foam arrows pointing in all different directions! Then, guests, we greeted (or warned) with a homemade chalkboard hanging on the door. 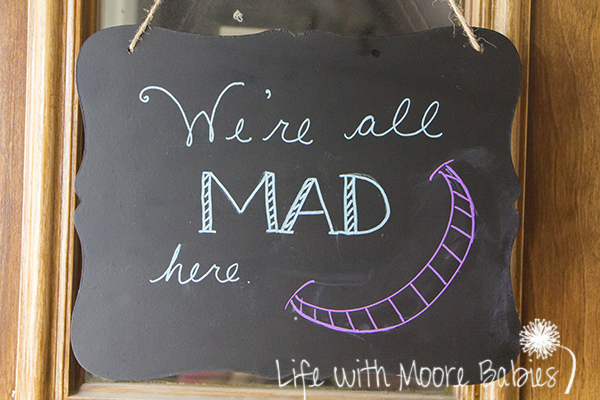 Honestly, this particular quote is pretty fitting to our family, so the sign stayed up for several months! 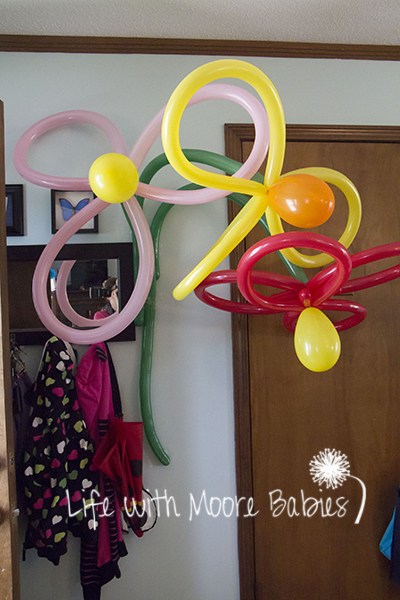 As you entered the house giant, balloon flowers were there to welcome you! My husband made these; I can't do a thing with balloons! 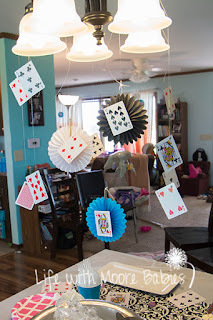 We hung cheap playing cards with fishing line in various places around the house with the Queen of Hearts taking center stage over the table! I wrote "Happy Birthday" on our white board, which is in our dining room since it doubles as the school room, and the girls decided to illustrate parts of the story. 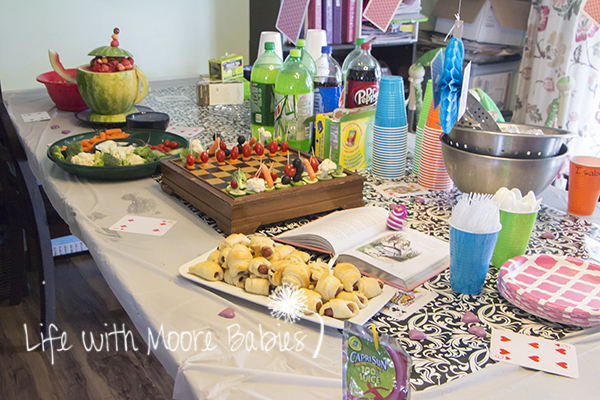 I could not find a black and white tablecloth anywhere that looked appropriate for this party. 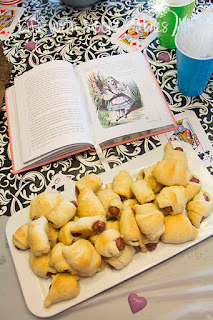 In fact all the black and white table clothes I found looked like racing flags, so I used this trick instead: use a solid tablecloth with a roll of wrapping paper as a table runner! Foods included mini pigs in a blanket, with our copy of the book open to the reference for those who had only seen the movie. 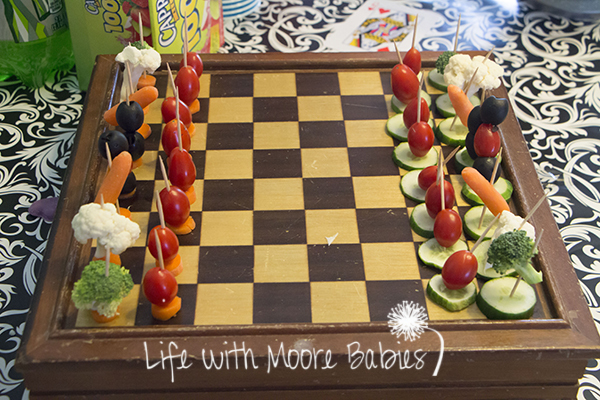 We also set up a veggie chess board: carrots vs. cucumbers! I had more vegetables on the side along with dip, although the toothpicks did not stop all the kids from wanting my chess pieces! 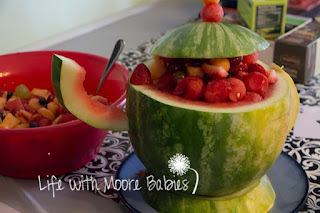 We also had a watermelon tea pot filled with fruit salad; luckily the time of day didn't necessitate a full meal! To drink we had the usual soda and water and tea! Lots of flavored teas in fact. 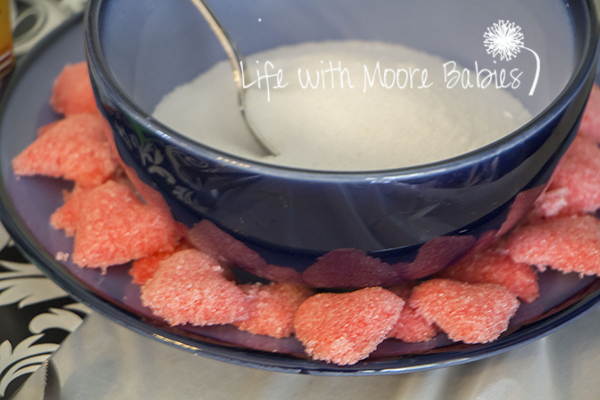 I even attempted making little heart shaped sugar cubes! We may have gone light on the food, but we definitely had enough cake to make up for it! 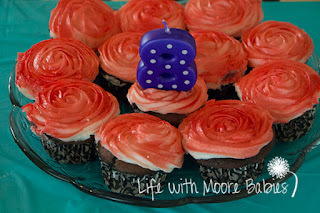 We had chocolate cupcakes with white rose icing that we sprayed for the partially painted look. 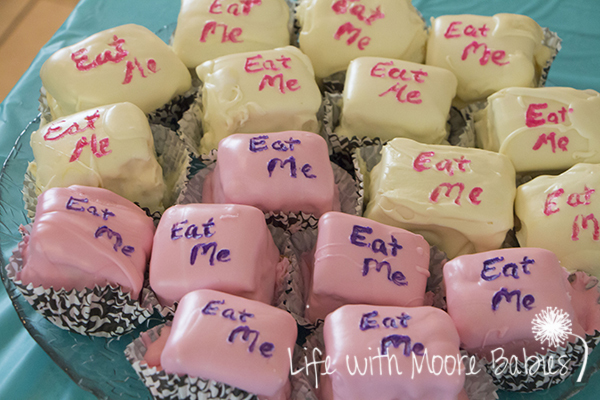 We also made petite fours in two flavors. 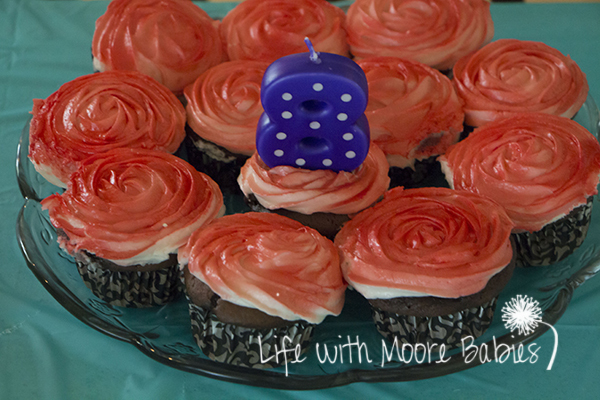 Well they weren't too petite since I was a bit impatient, but they were a nice size for eating like a cupcake! 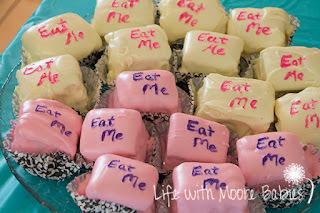 Ours were white cake with either apricot or strawberry jelly filling. 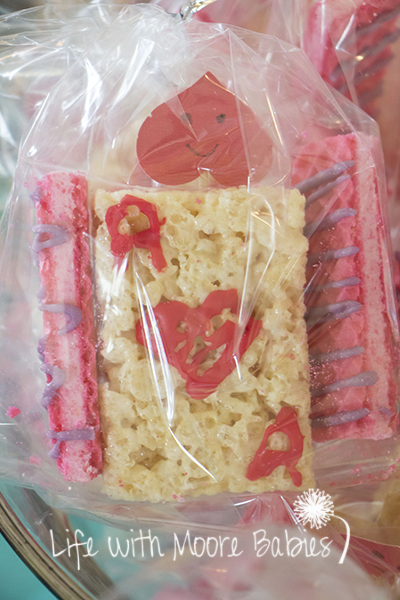 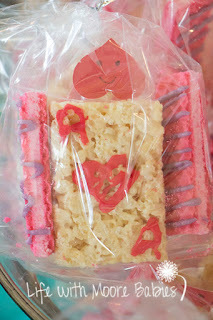 The treat bags we sent home had these cute rice krispie cards and Cheshire Cat tail wafer cookies! In fact, we even had a Cheshire Cat show up at the party! 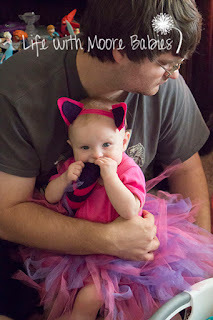 And true to form, she was very ornery! 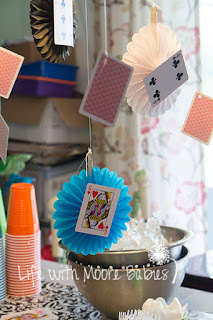 We had intended to play croquet as our party activity, but it was a little drizzly during the main part of the party. It did clear up at the end, so those who hung around played a little. Somehow I missed getting pictures of them playing. 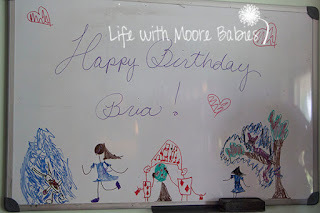 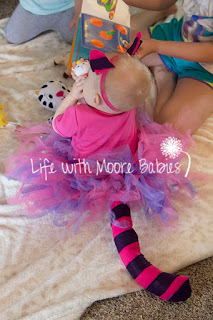 For the most part, I don't plan a whole lot of activities for parties anymore because the kids seem to just enjoy being together and doing whatever they want! 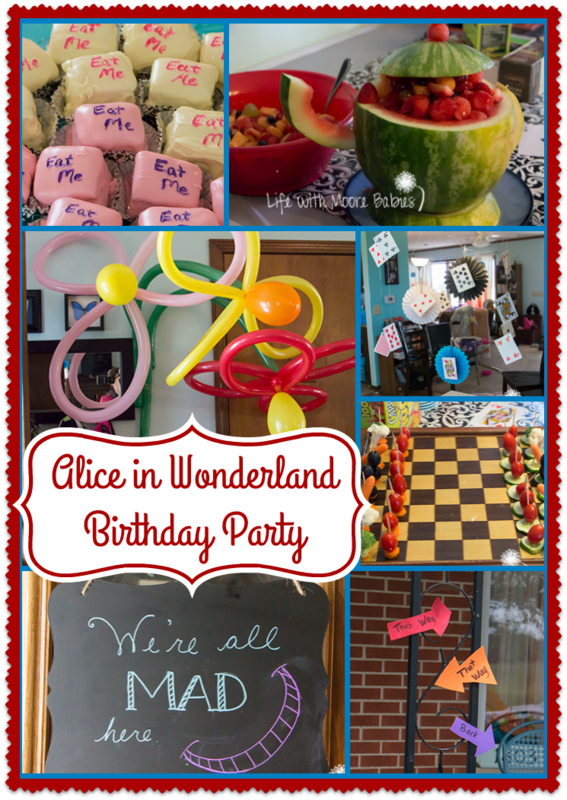 I do wish my kids would choose more book themed parties; I much prefer planning them, but then again, I am generally a book nerd. 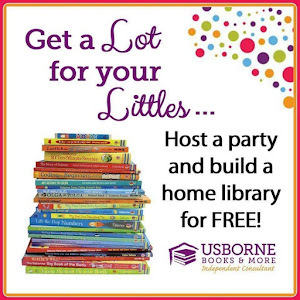 What book would you like to turn into a party?